India is the second largest market after China that sends students to study abroad every year. The trend is on the upswing as more than 50% of India’s current population of 1.32 billion is below 25 years. Why are more students increasingly making the crossover to the International colleges and universities? No Indian university including the IITs and IIMs has a global ranking in the Top 200. The Indian Institute of Science (IISC) figures in the 250-300 rank. The competition for admission to Indian institutes is much higher than even a top 20 universities in the world. Also, the cost of seats under the management quota for professional colleges in India is unregulated in India and highly costly. Some times, it is less expensive to study in the top ranking universities abroad than in much less reputed colleges in India. When it comes to costs and return on your education investment, unfortunately in India, even in popular streams like science and engineering (specifically research), the pay in after doing Masters is meager. You can safely trust most of the universities abroad as they have an excellent standard of education, maintained by the educational, regulatory bodies of the country. Getting admission to India’s premier institutes like the Indian Institute of Management (IIMs) or Indian Institute of Technology ( IITs) are highly competitive and stressful. Note this – On an average, an Indian student has lower than one in 50% chance in gaining admission to a highly reputed institute of technology and business. The high cut-off marks for national level exams such as the Joint Entrance Exams (JEE mains) for engineering colleges, National Eligibility and Entrance Test (NEET) for medical colleges and Common Aptitude Tests (CAT) for management colleges can demotivate even the brightest students to give up hope on securing admission to a course and college of their choice. Studying abroad is a much easier and streamlined process which brings hope and lots of career opportunities for Indian students. Admission to a highly-ranked college or university abroad is comparatively easier right from the undergraduate level. No wonder, an increasing number of Indian students are choosing to take the big leap and make the crossover for their undergraduate studies. While there are exams like GRE, TOEFL/IELTS, and GMAT, the syllabus for these exams is relatively simple. Also, it is only one exam that you have to give, unlike Indian national level exams. The admission requirement for selecting the students is also different for each university abroad raising your chances of making to a college of high reputation and standing. While it is true that the standard of Indian education is evolving, there is still a lot of development that needs to be done. One of the most significant grey areas is the lack of opportunities for the practical application of theoretical knowledge and skills gained through conceptual understanding. Little wonder that lakhs of Indian students are unemployable struggling to get job placements after graduation. The problem is not with the student but the Indian education system where the emphasis is on rote learning to remember concepts rather than understanding them. Classroom experience is limited to classroom lectures with little to no class participation. Maintain a good attendance record is the top concern for both faculty and students with little or no interest in either teaching or learning. Students interested in pursuing research do not receive enough support from Indian institutes in terms of finance, infrastructure, and resources. The student’s natural curiosity is crushed under the high academic pressure from Indian schools and colleges, leaving no room for innovative thinking and development. In contrast, there is a lot of focus on student-driven learning, engaging them in the active learning process via class participation, discussions, case studies, and practical off- and on-campus experiences that make learning a fun, productive and meaningful experience. Universities abroad provide abundant resources such as sophisticated technology, equipment, and infrastructure which encourage and motivate students to conduct in-depth research. There is a lot of focus on creative thinking and innovation in the education system abroad which organically builds a student’s self-esteem and confidence levels. Studying abroad polishes your soft skills, and allows you to focus on your hobbies ranging from mountaineering to painting which isn’t given as much importance in India. In India, the focus is only on the popular STEM (science, technology, engineering, and mathematics) courses. Very few options are available for students who are interested in pursuing other streams of education. Even if their desired course is available, the school does not have the expertise and accreditation to prepare its students for a more prosperous career path. The sheer range and variety of courses available to students abroad in countries like USA, UK, Canada or Australia are mind-boggling. You are sure to find a course of your interest in a reputed college and universities abroad in the most unconventional and contemporary subjects like sports, baking, psychology, filmmaking or entertainment with greater scope and structure. You may end up with a diploma if you study these courses in India. But abroad, you will study in-depth and have a fully accredited Bachelor’s Degree which holds a lot of value in your field of interest. As a student studying abroad, you can opt for ‘dual major’, ‘minor’ and ‘free electives’ when choosing a course and allowing you to specialize in diverse subjects. You could be doing your masters in engineering with few credits in accounting and marketing as well. It throws open more career doors for you in various streams in the global markets. Apart from flexibility in courses, universities abroad gives you the freedom to work on a part-time basis while pursuing your education. Many universities abroad allow international students to work on campus, and off-campus. When you study and work in India, emigrating to a country of your choice becomes tougher. But if emigration is one of your goals for better prospects for your career and family, then it makes sense to start early and look to study abroad at the graduate level. Many countries like the USA, Canada, and Australia offer attractive job prospects after graduation, and their flexible immigration rules allow students to look for employment after completing their studies. 80% of students from India and other Asian countries choose to remain in the USA after completing their graduate and doctoral studies according to the latest US National Science Foundation’s Survey. Obtaining permanent residence abroad becomes easier once a job is secured, helps gain access to higher salaries leading to a better lifestyle and facilities. 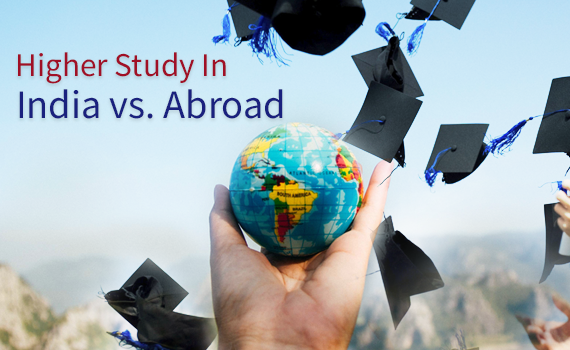 Studying abroad is the clear winner here as there is a vast difference in the quality of education between the Indian and International institutions. It is the better option out of the two. Today, you have various funding and scholarship opportunities available for your benefit. The benefits of an international education help you build a stable and secure career and future. 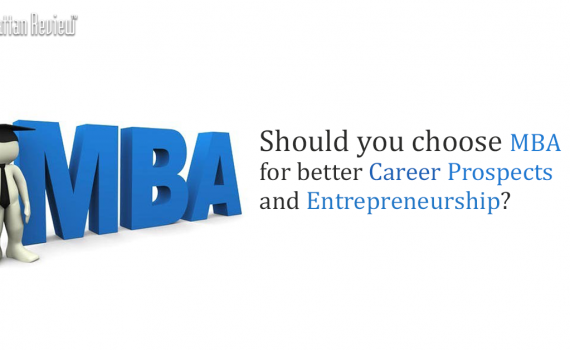 Should You Choose MBA in Abroad For Better Career Prospects And Entrepreneurship? Tags : MBA Admission ServicesMBA In Abroadoverseas education. The MBA program is one of the most sought after degrees in the world by aspirants from all walks of professions. This universal and versatile program fits well with any graduate stream, be it arts, science, technology, media, commerce or even the military. So, should you choose an MBA program? The MBA program from a reputed B-school is perfect is if you are interested in career advancement, and job opportunities with a better salary. It gives you a big jump from your current job position to your desired title and position. There are many reasons why companies prefer MBA graduates from top B-Schools abroad to manage business operations. There are many subtle nuances to the MBA program which polishes you from a regular executive to a global business leader. You learn the practical applications of your technical knowledge, strategic thinking, business, analytical, and qualitative skills during the MBA course. Employers most value the well-rounded personality of an MBA professional. The value of your MBA depends a lot on the reputation of the B-school that you attend. Most successful executives are alumni from top B-schools in the world. Studying MBA from a premier B-school gives you easy access to a network with some of the world’s best global leaders. You can build a strong network with the prestigious alumni of the university, and guest faculty or speakers. The MBA education gives you the flexibility of thought and capability to operate for different companies. It gives you an understanding of the various aspects of business helping you bring a broader value base to any company. It gives you an edge over the other executives as you work as the bridge between different departments. As an MBA graduate, you are the force multiplier in your organization. You will be that leader who will be pulling everyone working on their own in the right direction. You will utilize everyone’s strengths and get them all on the same page. Many MBA graduates from premier B-School have confirmed how the degree has helped them achieve their career goals. It has helped them deal with a diverse set of clients from across the world and give them a holistic idea of how the business operates. The MBA education equips you to handle all business areas such as finance, technology, and operations and provide business expertise to small start-up clients to big corporations. You help clients make educated decisions. An MBA abroad is a smart investment for anyone who aspires to become a C-suite executive overseeing multiple divisions of a business. If your career goal is to influence business and strategic decisions and the path that a company should take, then you need to seriously think in the lines of getting an MBA degree from the top B-Schools. The foundations in business and management that an MBA education provides can offer you a variety of career paths, and we’ll explore some of the diverse opportunities available in the fields of health care, entertainment, technology, and more. In our next article, we explore the various career paths and opportunities that are open to MBA graduates. If you need more assistance with career planning, you can contact our career experts for professional guidance.